WORDS & IMAGES BY ALAN HAIG-BROWN “We don’t usually remove the heads at mid-life on RPM, in the Seaspan Venture at 42,000 hours, as the water ? ow to the propellers. This ? ne hull form, com- the Cummins engines,” Randy Beckler, Shore Engineer tug was due for its quadrennial inspection by Trans- bined with a smooth “slipper” stern reduced the wake for Seaspan Marine, explained in reference to the 2003 port Canada. 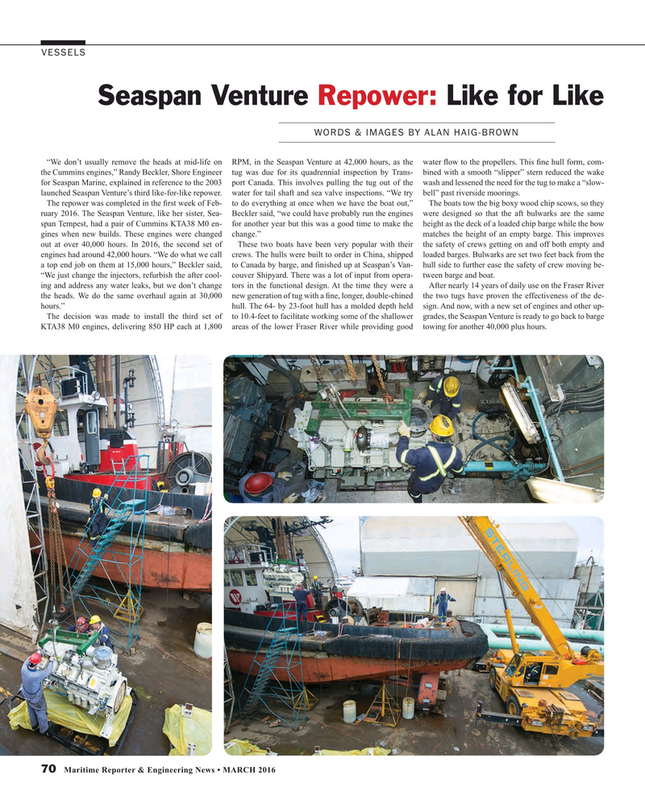 This involves pulling the tug out of the wash and lessened the need for the tug to make a “slow- launched Seaspan Venture’s third like-for-like repower. water for tail shaft and sea valve inspections. “We try bell” past riverside moorings. The repower was completed in the ? rst week of Feb- to do everything at once when we have the boat out,” The boats tow the big boxy wood chip scows, so they ruary 2016. The Seaspan Venture, like her sister, Sea- Beckler said, “we could have probably run the engines were designed so that the aft bulwarks are the same span Tempest, had a pair of Cummins KTA38 M0 en- for another year but this was a good time to make the height as the deck of a loaded chip barge while the bow gines when new builds. These engines were changed change.” matches the height of an empty barge. This improves out at over 40,000 hours. In 2016, the second set of These two boats have been very popular with their the safety of crews getting on and off both empty and engines had around 42,000 hours. “We do what we call crews. The hulls were built to order in China, shipped loaded barges. Bulwarks are set two feet back from the a top end job on them at 15,000 hours,” Beckler said, to Canada by barge, and ? nished up at Seaspan’s Van- hull side to further ease the safety of crew moving be- “We just change the injectors, refurbish the after cool- couver Shipyard. There was a lot of input from opera- tween barge and boat. KTA38 M0 engines, delivering 850 HP each at 1,800 areas of the lower Fraser River while providing good towing for another 40,000 plus hours.